Could there be a better way to serve anything than when covered with a creamy sauce and cheese? 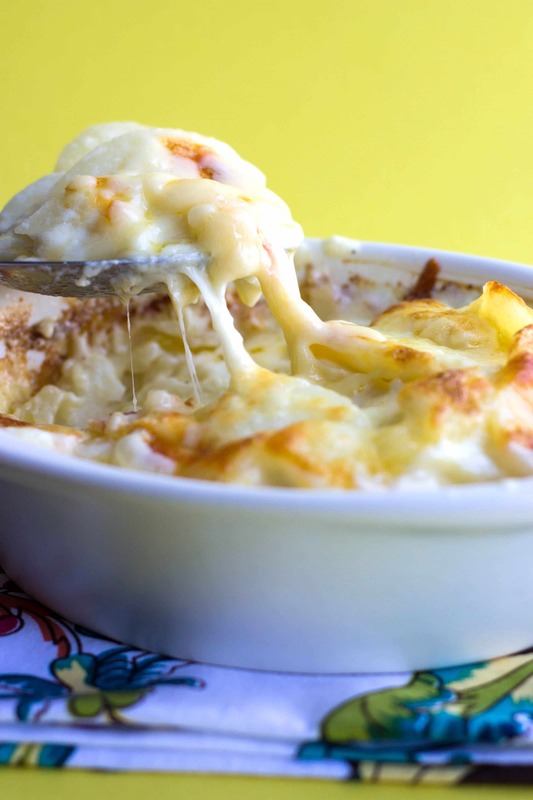 This recipe for Cheesy Scalloped Potatoes is comfort food at it's finest! 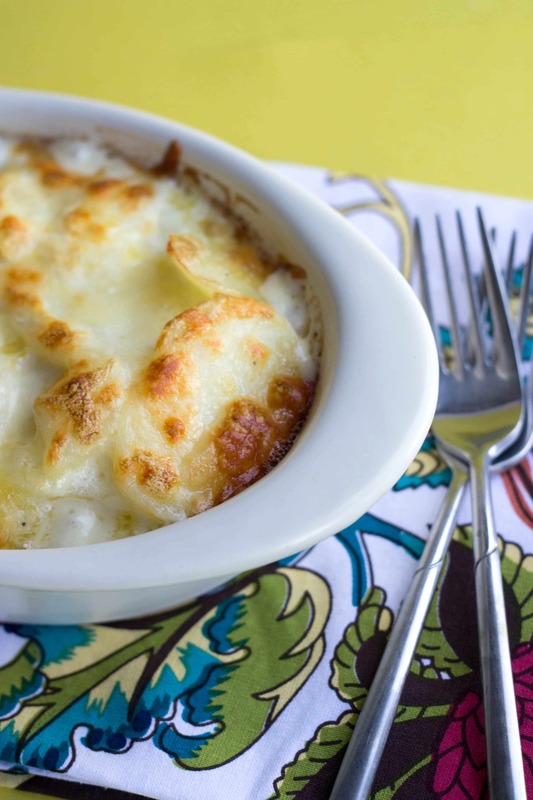 Could there be a better way to serve anything than when covered with a creamy sauce and cheese? 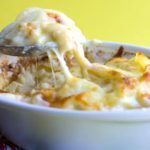 This recipe for Cheesy Scalloped Potatoes is comfort food at it’s finest! 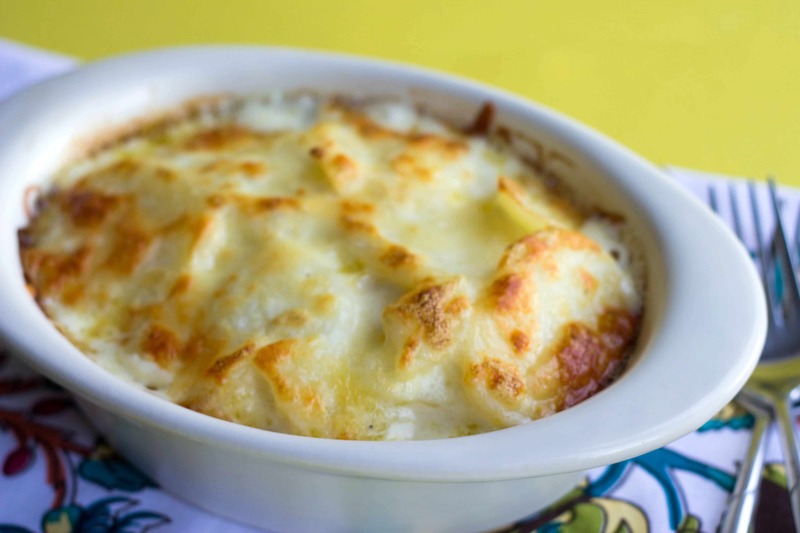 Get your comfort food right here! I know this isn’t exactly a summery dish, but who needs to wait until winter to indulge in creamy, cheesy goodness? I have very little time today so this post will be super short, but I promise I’m making up for my lack quantity with a huge amount of quality because this dish is outstanding! It’s super easy to make so throw it together, grab yourself a plate and dig in! You will not be disappointed! Using a slotted spoon, remove the bay leaf, garlic and parsley. Mix in the Parmesan cheese and set aside. Slice the potatoes and add them to a large bowl. Pour the cream over potato slices. Mix to coat the potatoes. Mix gently to incorporate. Add the mixture to the casserole dish and spread the mixture evenly over the dish. Top with some Parmesan cheese & the cheddar, cover the dish with aluminum foil (making sure the foil is not laying directly onto the cheese), and bake for 30 minutes. Remove the foil and bake another 10 minutes or until the top is golden brown. I have pinned every single recipe from your site on my pinterest feed- guess it’s time I made it official and signed up for emails!! How great! I’m so glad to have such a loyal follower! ? Hi Ronald, sorry for the late reply. It’s better off anyway, because I don’t have a good answer for you. I’ve never tried and I wouldn’t want to ruin anyone’s thanksgiving! You can certainly make it and re-heat it though! Hi Akerah, Thank you for the comment. I’m really sorry there aren’t more pictures on preparation of my dishes. I do try, but don’t always have the time or the best lighting in my kitchen. Savory dishes especially, as they are actually the dinners I cook for my family and and it;s hard to stop and snap photos as I go. I will try to do more step by step pictures.